We are currently working on the nesting biology of ants. 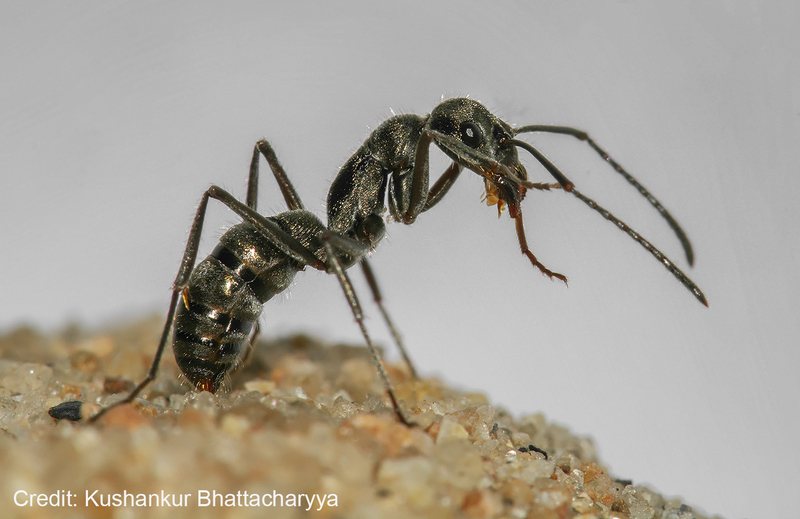 Diacamma indicum is a queenless ponerine ant found in India, Sri Lanka and Japan. It has a constant species-specific chromosome number and its genetic variability is lower than that of other sympatric species. The colonies are monomorphic and on average there are less than one hundred workers present. The female who can produce fertile offspring is not morphologically different from other females in the colony, except for the retention of a pair of appendages called the gemmae, and hence is termed as gamergate. Nest relocation in this species involves tandem running, where one ant leads another towards the target nest.